This week is almost like my second Christmas. Nah, make that my third Christmas; the second one comes during the first week of the Olympics. It starts with the opening ceremonies and then I’m glued to the TV every hour the swimming events are on—prelims, finals and all the story clips in between. I’ve annoyed roommates with my antics (just ask any of the friends I lived with in 2000 during the Sydney Games). I’ve filled many a VHS with coverage—and refuse to tape over them. If I’m lucky, I think I could still dig up my tapes from 1992 when I first recorded the swimming races. And I’ve studied many a film, much like a football player would to study his opponents, yet I did it to pick up tips and teach myself better technique. But prime time coverage for the swimming Olympic Trials? This year is just too good. So what if it's the result of amplifying Michael Phelps to near-God status and beefing up a rivalry between him and Ryan Lochte (I've already been reminded too much tonight)? It sure beats missing the trials because they were televised on tape delay on a random Saturday afternoon, lumped into other sports coverage. Except for one thing: my mind is already racing with questions from one hour of Trials watching. Call me an inquisitive reporter, but here's what I'm asking myself about the week ahead and might unfold. I love swimming to the point where I camp out on my couch for a week every four years (it already started again with me mesmerized by the 400m IM when I should have been cycling). But…why did they get a week’s worth of prime time coverage while I have to hunt down most of the track and field results online? 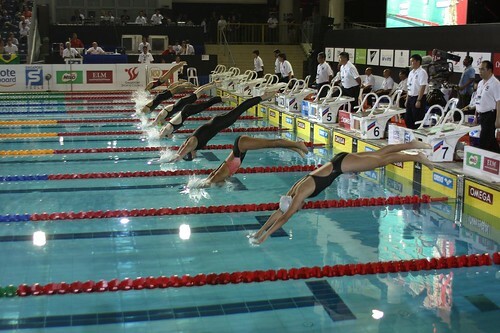 The fancy, fast full-length suits we envied in 2008 were banned from competition shortly after Beijing. Are those fast times going to be tougher to reach? And how many records are going to fall this week in Omaha? How do they construct that competition pool in a 13,000-person arena? I found some facts at USA Swimming, but I'd really love to see a time-lapse video like the one NBC aired of the pool inside the Water Cube four years ago. The 13,000 spectators. How many of them are there for the sake of watching and how many are cheering on friends and family competing? Janet Evans’ return to the pool is practically old news, but veterans like Amanda Beard, Natalie Coughlin and Jason Lezak are also vying for Olympic berths. What veteran swimmers are going to make it onto the team? How many times are we going to be reminded of the Phelps/Lochte rivalry that I swear has only been amplified by the media? It’s only day one and I can already tell that this week’s workouts are going to suffer. Forget the bike and the run, I'll be glued to the couch from 7 to 8 p.m., more should I dare switch over to NBC Sports. Guess that means, I'll be easy to track down. If you need me, I'll be [watching] swimming. Photo grabbed from WhyOhGee at flickr.